Best trendy and traditional winter ready to wear Pakistani clothes for girls is for young girls and working ladies to revitalize the boring wardrobe with latest winter hues and offered by Rang Ja clothing. Rang Ja a leading fashion brand that offers ethnic clothing and colors with a touch of glamour. It is known to be a brand that revives the fashion of traditional short shirts in a unique way. Rang Ja brings evolution to the Pakistani fashion trends, turning the trend of voluminous frocks to short traditionally embroidered shirts and shalwars with khusases. If you want to fill your dream closet visit the rang Ja attires for ethnic yet trendy cuts, designs, shapes, sizes, and colors contrasts. 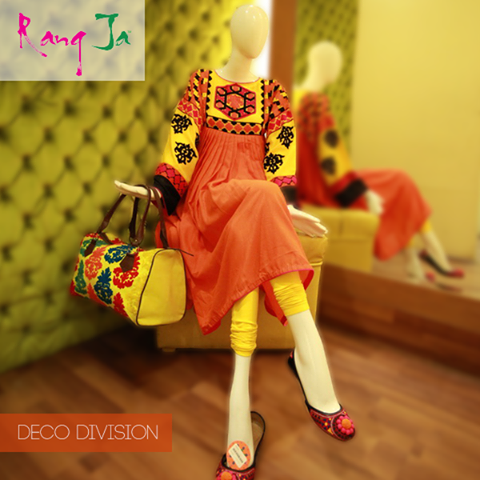 This winter fall acquires a mesmerizing look by wearing the best fashion dresses by Rang Ja. This brand is not offering the latest kurta dresses for girls but also offering kurta shalwar suits for boys/men, traditional khussa and chappal, clutches with embroidery patterns. Here is the latest Rang Ja winter fall collection 2019 and Nine to five collections for working women to get some inspiration for new fashion trends.